If you are a fan of the old Floid Blue, we have some very good news for you. While Floid Blue may have been discontinued, Epsilon has made an exact reproduction. Everything from the scent, to the face feel to the iconic 400ml glass bottle is the same. Just like Floid Blue, Epsilon Blue seems to have a mystical power to turn a decent shave into a BBS shave. It soothes, tones and cools (due to the menthol content) and has a very clean scent. Never cloying and always welcomed. At 400ML and in a thick apothecary bottle, this bottle will last you a long time. You will enjoy every minute. Great offering Phil. This will please many! Looking forward to trying the blue. Curious though, Phil's write up here on The Nook says it is 400 ml, but BG says 500ml. Which is it? (04-02-2018, 02:07 PM)lbkindy Wrote: Looking forward to trying the blue. Curious though, Phil's write up here on The Nook says it is 400 ml, but BG says 500ml. Which is it? NICE! I'm in. Now if you could bring back the Asylum/SV Colonia you would be better than Santa Claus. Glad I jumped on it. It is now sold out. I was going to order it when it was in stock but the shipping scared me away. I've got to find a solution to that or get to the $80 free shipping point. (04-03-2018, 02:58 PM)lbkindy Wrote: Glad I jumped on it. It is now sold out. I got the email that it was in about 5 PM Eastern. Checked the website for the price and it was available. For grins I checked back about 9 PM and it was sold out! No clue how much had been in stock, but that has to be some kind of land speed record! (04-03-2018, 03:22 PM)NJDJ Wrote: I was going to order it when it was in stock but the shipping scared me away. I've got to find a solution to that or get to the $80 free shipping point. It ends up weighing a bit over 2 lbs shipped for one bottle. Would love to hear what people think when you guys get to use it. Once I'm done with my 25-30 AS splash bottles, I'm going a more simple route, because I focus my scent of the day on the fragrance I'm wearing and NOT the after shave, so my after shaves have to be simple in scent yet with that slight alcohol burn to give you that clean atringent feeling, before you apply your balm and/or face cream. Epsilon Blue and Proraso Green in the larger bottles are most likely the 2 bottles I will end up with as my after shave splashes. Does anybody know if the Epsilon Blue contains witch hazel ? I received a bottle just about a week ago. It smells clean and soap like. I like the face feel too. Will certainly be in my rotation, but will not one of my favored aftershaves. I don't find witch hazel on the ingredients list. (04-09-2018, 03:46 PM)lbkindy Wrote: I received a bottle just about a week ago. It smells clean and soap like. I like the face feel too. Will certainly be in my rotation, but will not one of my favored aftershaves. 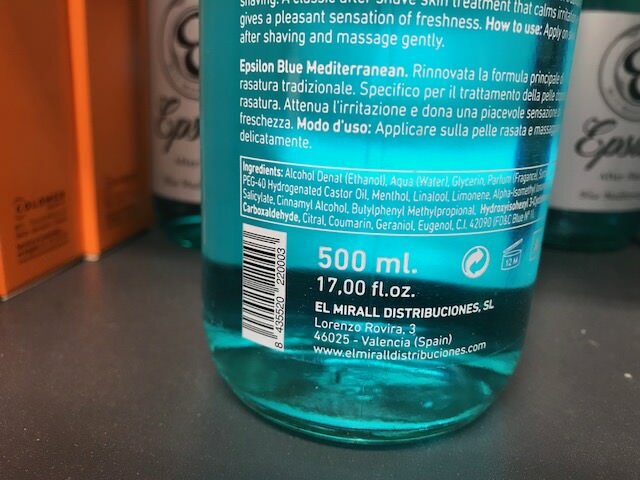 How close is it to Floid Blue in terms of scent ? I couldn't say how close it is to Floid Blue. I never tried it. 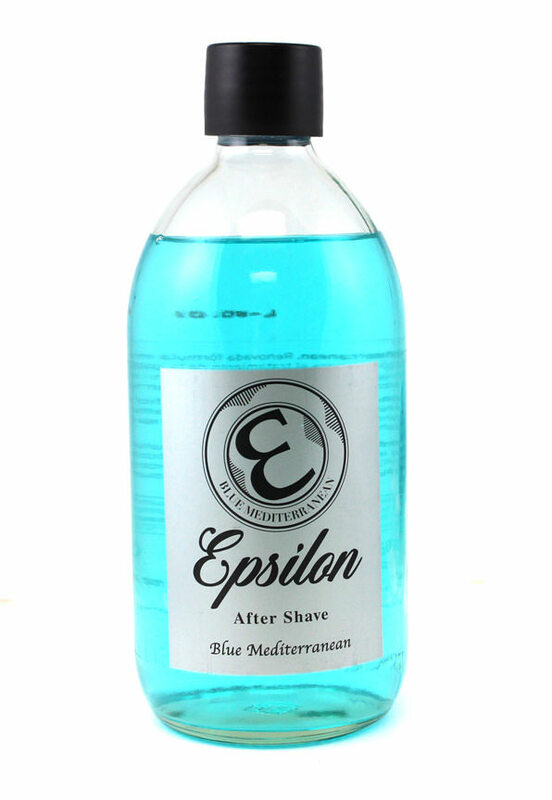 The Epsilon Blue aftershave is back in stock! (04-10-2018, 08:38 AM)bullgoose Wrote: The Epsilon Blue aftershave is back in stock!